The complete set of UKG Worksheets in India based on all syllabus and boards (CBSE, ICSE, ISE SSC, Cambridge etc). Page1:Empty fields where your child has to write the lowercase version of letters from ‘a-z’. Page2:3 columns: pictures, uppercase and lowercase version of letters. Your child’s task is to match the pictures with the correct capital as well as small letters. Page3:A variety of pictures. The first letter from the names of each of the pictures has to be written by your child. Page4:A lemon trying to reach a lollipop with many barriers in between. Your child’s task is to help the lemon reach the lollipop. Page5:Letters from ‘a-z’. Your child’s task is to colour the vowels in red and consonants in blue. She/he also has to write down the vowels in the empty boxes. Page6:Pictures and alphabets as options to choose from. The vowel that appears in the name of the corresponding picture has to be circled by your child. Page7:Words consisting of 2 letters. Your child has to colour those words that consist of one vowel and one consonant. Page8:Pictures and words. Your child’s task is to match the words with the correct pictures. Page9:Pictures and words. The words have a missing letter that has to be completed by your child. Page10:A variety of words containing exactly one vowel each. Your child’s task is to assign every word according to the appropriate vowel’s field. Page11:A sequence of 3 pictures. Your child has to identify them and then combine the first letters from the names of each picture to form a new word. Page12:A few incomplete words without their first letter. 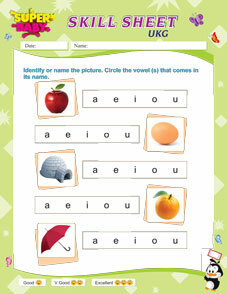 Your child’s task is to identify all the possible words that can be derived from the first letters provided. Page13:Pictures and their names in form of coded numbers. The codes have to be understood and decrypted by your child. Page14:A puzzle involving 3-lettered words and pictures. 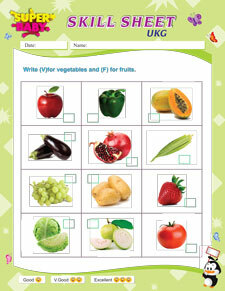 Your child’s task is to identify the pictures and fill in the words in the correct sequence. Page15:Pictures and 3 possibilities each that might rhyme with the name of the corresponding picture. Your child’s task is to pick the word that rhymes with the name of the picture. Page16:A variety of pictures. Your child’s task is to identify them and write down whether the name of the picture is preceded by ‘a’ or ‘an’. Page17:An object, its name and a larger quantity of that object. The plural form of that object has to be written down by your child. Page18:Pictures and sentences based on them. Your child’s task is to fill in the blanks by writing down ‘a’ or ‘an’ wherever appropriate. Page19:A word and its reversed version. The words provided have to be written in reverse and understood by your child. Page20:Pictures and incomplete sentences based on them. 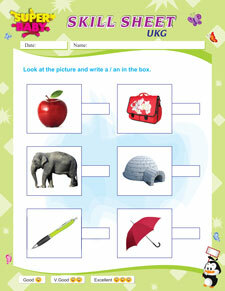 Your child’s task is to identify the pictures and complete the sentences. Page21:Pictures and incomplete sentences based on them. Your child’s task is to identify the pictures and complete the sentences by choosing between ‘this’ or ‘that’ appropriately. Page22:Pictures and incomplete sentences based on them. Your child’s task is to identify the pictures and complete the sentences by choosing between ‘these’ or ‘those’ appropriately. Page23:Pictures and incomplete sentences based on them. Your child’s task is to identify the pictures and complete the sentences by choosing between ‘yes’ or ‘no’ appropriately. Page24:2 activities taking place and a question. Your child has to identify the activities and then answer the question by ticking the correct picture. Page25:2 columns consisting of contrasting pictures in random order. Your child’s task is to match the appropriate opposites. Page1:Similar objects with an odd one included. Your child’s task is to circle 2 objects in each row that are identical. Page2:2 columns. Your child has to identify the object in the left column and match it to an identical version of it in the right column. Page3:3 objects that share an attribute and 1 object that is the odd one. Your child’s task is to identify the shared attribute and then cross out the odd object in each row. Page4:2 groups of 2 similar objects varying in size. The bigger object in each group has to be coloured by your child. Page5:2 groups of 2 similar objects varying in size. The smaller object in each group has to be coloured by your child. Page6:4 groups of 2 similar objects varying in quantity. 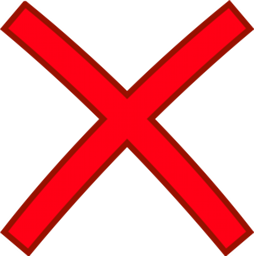 The box with the larger quantity in each group has to be ticked and the box with smaller quantity has to be crossed out by your child. Page7:4 groups of 2 objects. Your child should mark the heavier object as ‘H’ and the lighter object as ‘L’. Page8:Outlines of various shapes. Your child’s task is to colour the circles in red, triangles in blue and squares in yellow. Page9:Shapes and different objects. The objects have to be matched with the correct shapes they resemble by your child. Page10:Numbers and beads on a necklace. Your child has to count the number of beads on each necklace and then match it to the appropriate number. Page11:Outlines of ladybirds. Your child’s task is to identify the number provided beside each outline and then draw the corresponding number of spots on each ladybird. Page12:Apples of varying quantity in different boxes. Your child has to count the number of apples in each box and write down the appropriate number. She/he then has to write down the numbers from ‘1-10’ in the correct sequence. Page13:Outlines of beads on a necklace. Your child’s task is to write down the missing numbers from ‘1-20’ inside each bead. Page14:A sequence of numbers with certain fields missing. Your child’s task is to write down the missing numbers that come after, in between or come before the hints provided. Page15:Rows of similar objects varying in quantity. Each row has to be counted and the appropriate number has to be written down by your child. Page16:Numbers from ‘1-10’ and their names in 2 columns. Your child has to match the numbers with their correct names. Page17:50 empty fields. Your child’s task is to write down the numbers from ‘1-50’ in the correct sequence. Page18:Numbers from ‘1-20’ and empty fields next to them. Your child has to write down the names of all the numbers. Page19:Different objects in varying quantities. Each type of object has to be counted and the appropriate number as well as its name should be written down in the in box provided by your child. Page20:Numbers placed in an incorrect sequence. Your child has to rearrange the numbers in the correct sequence. Page21:Sequential numbers placed in a random order. Your child’s task is to write down the numbers from smallest to biggest. Page22:Groups of numbers placed in a random order. Your child’s task is to write down the numbers from smallest to biggest in each group. Page23:50 empty fields. Your child’s task is to write down the numbers from ‘51-100’ in the correct sequence. Page24:Groups of similar objects varying in quantity. In each row, your child has to count and then add them. Page25:Groups of similar objects varying in quantity. 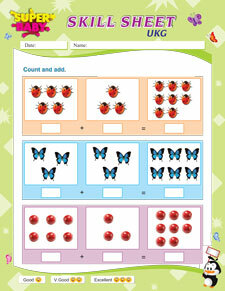 In each row, your child has to count and then draw the appropriate total number of objects. Page1:Outline of a boy and a girl and a couple of pictures. Your child’s task is to identify herself/himself with the correct gender outline and colour it. Once that is done, she/he also has to choose and tick the correct picture representing genders. Page2:A family tree without the pictures of various relatives. The pictures of the relatives specified have to be pasted by your child. Page3:Outline of a house. Your child has to colour it in such a way that it is similar to your home. Page4:2 columns showing different rooms and the various things found in those rooms. Your child’s task is to match the location of the things to the correct room. Page5:2 columns showing different body parts and the respective objects needed for them. The body parts have to be matched to the objects that suit them by your child. Page6:Pictures of different animals. Your child has to identify and tick the domestic animals. Page7:Pictures of different animals. Your child’s task is to write ‘W’ for wild animals and ‘D’ for domestic animals. Page8:2 columns showing different animals and the kind of food they eat. The animals have to be matched to their preferred diet by your child. Page9:Animals and their babies. 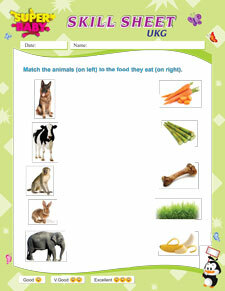 Your child’s task is to match the adult animals with their appropriate babies. Page10:Animals and various animal homes. The animals have to be taken to their appropriate homes by your child. Page11:Outlines of 3 animals. Your child has to colour those animals that can be kept as pets. Page12:Outlines of 3 animals. Your child has to colour those animals that can only live in water. Page13:Pictures of different birds. Your child has to tick the birds that can be kept as pets and cross out the ones that cannot be kept as pets. Page14:Pictures of different insects. Your child has to circle those insects that can fly. Page15:Outlines of different vegetables. Your child’s task is to colour them in their natural colours. Page16:Pictures of different fruits. Your child’s task is to tick the fruits that she/he likes to eat. Page17:Various fruits and vegetables. The vegetables have to be marked as ‘V’ and the fruits have to be marked as ‘F’ by your child. Page18:An outline of a plant whose parts have been coded with different colours. 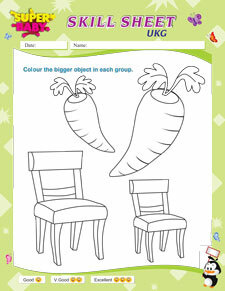 Your child’s task is to colour the plant according to the colour codes provided. Page19:Outlines of various flowers. Your child has to colour them and pronounce their names out loud. Page20:Pictures of different vehicles. Your child’s task is to tick those vehicles by which she/he has travelled. Page21:Pictures of different vehicles. Your child has to circle those vehicles that she/he can see on the road. Page22:Pictures of community helpers and the instruments used in their profession. Your child’s task is to match the instruments with the correct helpers. Page23:A group of objects that are used at different times of the year. 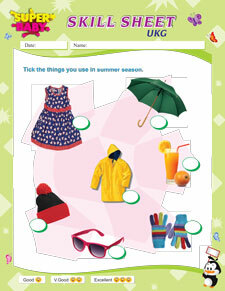 Your child has to identify them and then tick those objects that are particularly helpful during the summer season. Page24:Outline of an umbrella. The umbrella has to be coloured by your child. Page25:Outline of a rainbow with colours written in alphabets. Your child’s task is to identify words and colour the rainbow according to the marked regions.